For c.120 hours at Grade 6 (£13.71 ph). Dr Caroline Dodds Pennock is seeking to appoint a fixed-term research assistant to produce teaching materials related to her Aztecs Abroad project. Funded by a Senate Award for Excellence in Learning and Teaching, the successful candidate will be responsible for developing a set of translated primary-source materials related to indigenous Americans in Spain. The Aztecs Abroad project studies the neglected history of Native American travellers to Europe. Beginning with indigenous Central and South Americans who travelled to Europe in the sixteenth century, this research seeks to transform our understanding of transcontinental networks, globalisation and the multicultural roots of modern society. The research is based on a wide range of documents, including traditional manuscript and published sources, art and material culture. This post is intended to produce a collection of documents suitable for use in teaching on a topic where primary sources in English are frequently scarce. In the long term, the intention is also to make these documents more widely available via the web in order to facilitate teaching and research on this neglected topic. The Research Assistant will be responsible for identifying and translating sixteenth-century documents concerning indigenous Americans (‘indios’). The RA will work principally with pre-transcribed texts, including which may include material from the Archivo General de Indias, Seville, as well as printed letters, manuscripts and chronicles. An ability to read and transcribe sixteenth-century Spanish manuscripts would be an advantage, but is not essential. Depending on constraints of time and the expertise of the candidate, the Research Assistant may also begin exploring possibilities for the digitisation of these texts, with a view to making them available to students and teachers via the web. The post is for 120 hours in total. There is flexibility as to the working pattern, to be agreed with Dr Dodds Pennock.This role is paid at grade 6.1 on the University of Sheffield salary scales (£13.71 per hour, plus holiday pay). The ability to interpret/transcribe 16th-century Spanish documents. 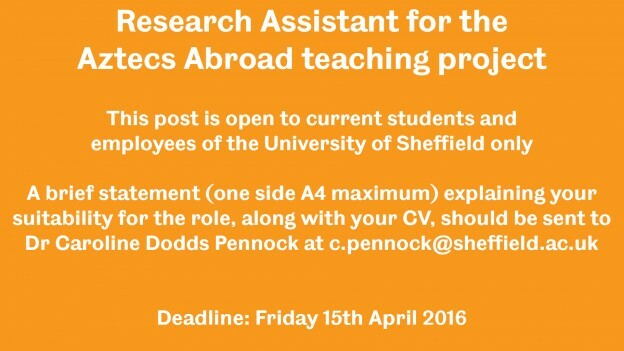 A brief statement (one side of A4 maximum) explaining your suitability for the role, along with your CV, should be sent to Dr Caroline Pennock at c.pennock@sheffield.ac.uk by Friday 15th April 2016. Informal enquiries about this post should be directed to Dr Caroline Pennock: c.pennock@sheffield.ac.uk, 0114 222 2579. This entry was posted in News and tagged Aztecs Abroad, Jobs on March 22, 2016 by Alice Johnstone.